Life of Lou: Victoria Sponge! This weeks recipe is an absolute classic and family favourite. I will be the first to admit that I am still working on perfecting the baking classics, Victoria Sponge included! For a long time I just couldn't get sponge cakes right. They either turned out to dense or chewy or just not quite right. However this fool proof recipe has changed my ways! Here is the worlds simplest Victoria Sponge thanks to "The Whisking Kitchen"
Preheat a moderate oven and grease one medium sized tin, lining the bottom with baking paper. In a large mixing bowl beat the room temp. butter with an electric mixer until light and fluffy . Then add eggs, sugar and vanilla, mixing until just combined. Add in flour and baking powder until all dry ingredients are mixed through. *Do not over beat the mixture otherwise the cake will become dense when baked. Bake cake for approx 25 minutes or until tooth pick comes out clean. Remove from oven and cool completely before slicing in half horizontally. Whip your cream in a large mixing bowl with electric mixer until fluffy. Spread a generous amount of jam and cream on two sides of the cake. 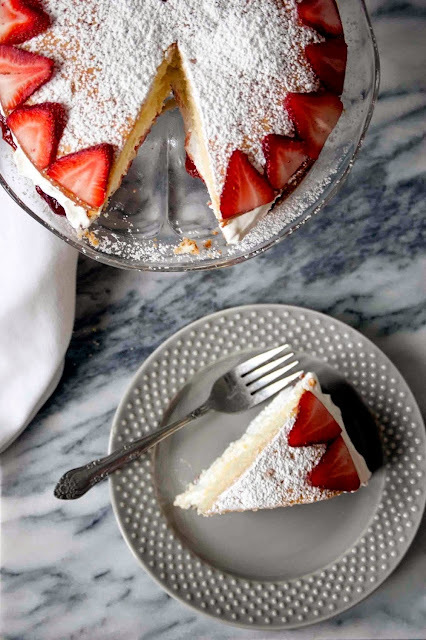 Then place strawberry slices on top and sandwich the two cakes together. Dust with icing sugar and share with family and friends! I am a blog reading, tea drinking, travel loving, cake enthusiast! Born and raised in sunny Australia I love the beach almost as much as a great bargain! This Blog is my happy place, where I get to share parts of my blessed, hectic and beautiful life! A little bit of everything Slice! My May / June reads! Mushroom, Parmesan and Tortellini Soup!